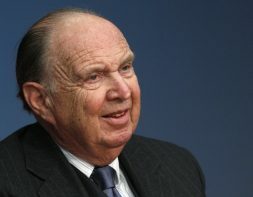 As chief economist at Salomon Brothers in the 1970s, Henry Kaufman was known as Dr. Doom for his gloomy prognostications about the economy and markets. Kaufman swung by Times Square to discuss the "Trump bump," the Fed, Wall Street culture and lessons learned at Salomon and beyond. A tight grip on costs and better fixed-income trading gains than Goldman helped the bank crank out an estimates-beating $4.4 bln of earnings. Rising rates helped, too, but CEO Brian Moynihan needs more help from the Fed and Donald Trump to boost its lowly return on equity. Randal Quarles looks headed to lead regulatory oversight at the central bank. He worked at Treasury but left before the crisis. He's expected to have a pragmatic view, despite Trump’s Dodd-Frank dissing. He may make more waves on monetary policy with a rules-based approach. The JPMorgan CEO’s latest shareholder letter hands President Trump and Republicans plenty of tips and sound bites for rolling back post-crisis rules. But the administration’s failure to replace the Fed’s departing top regulator throws more doubt on a Dodd-Frank overhaul. The Richmond Fed president quit after saying he had a hand in leaking policy details in 2012. It's a shock at an institution that hates surprises. The central bank’s slowness to examine itself may fuel demands for closer scrutiny – and sets a poor example for banks it regulates. Regulatory chief Daniel Tarullo defended the central bank’s post-crisis rules in a farewell speech. Trump wants a rollback but first he’ll need to replace the governor, which could take months. While bank bosses are clamoring for reform, the Fed may be on autopilot for a while. A clash between presidential economic adviser Gary Cohn and Treasury’s Steven Mnuchin is delaying the naming of a vice chair of supervision. Mnuchin’s refusal to reject protectionism at the G20 suggests a deeper split over trade. Goldman alums don’t guarantee policy coherence. With legislators from both parties critical of the U.S. central bank, the risk of its politicization looms large. Donald Trump has three empty board seats to fill, and maybe two more in 2018. The flawed experience at the securities enforcement agency offers a cautionary tale. GE executive David Nason has withdrawn from the running to head bank supervision at the Fed. Trump officials declined to offer support after critics noted his Treasury bailout role during the 2008 crisis. Other qualified people may also think twice about joining the new regime. In her first Senate testimony since the president took over, the Fed boss defended post-crisis rules and said banks are robust and lending strongly, contradicting Trump adviser Gary Cohn. Fed board seats are open, but rolling back regulation may need to wait for the next chair. The tough Fed governor is resigning five years before his term expires. Tarullo was the most influential architect of post-crisis financial reform, including the stress tests. His successor may be in better position to roll back regulation than any attempt to reform Dodd-Frank. A new book by Danielle DiMartino Booth, an adviser to ex-Fed hawk Richard Fisher, castigates the U.S. central bank's Ivy League groupthink and failure to change course since the crisis. Though Booth has a point, Janet Yellen and her colleagues aren't as omnipotent as she implies. The central bank nudged interest rates up again after a year's pause. Janet Yellen and colleagues previously sounded cautious but that was before the Trump bump. If bond yields, inflation and stock prices continue to rise, the Fed will be under pressure to make quicker increases. The prospect of tax cuts and higher interest rates in America invite comparison with the era of Ronald Reagan and Paul Volcker. U.S. bond yields and the dollar have started soaring, as they did then. But the threat of protectionism makes history an unreliable guide to the future. The central-bank chief plans to serve her full term under the new U.S. president. As important, though, is the undecided fate of Governor Tarullo, who wants harsher rules for Wall Street. If he goes, banks may be able to boost returns faster than any rate hike would allow. The great and good of finance convened to discuss ways to restore trust in the industry. Wells Fargo's forged-accounts fiasco added color to a discussion that's been more focused on Wall Street tomfoolery than Main Street's. The solution for both is to go back to basics. After years of undershooting price targets, some rate-setters, including Mark Carney in Britain, are now talking about tolerating overshoots. Equity winners will vary depending on whether inflation is of the good or bad variety. But global bonds are losers either way. An era of cheap money makes it easy to oversimplify the former Fed chairman's record. Sebastian Mallaby's new book, however, revels in the complexities of Greenspan's intellect, instinct and ego. His runs in Washington circles and spirited personal life are the real surprises. The economy added 156,000 jobs last month. That's decent but not stellar, allowing Janet Yellen to hold rates steady a week before the Nov. 8 presidential election. But wages and labor participation rose, giving Donald Trump enough to make the Fed a political punching bag. Federal Reserve Chair Janet Yellen and other rate-setters stand accused of pursuing policies that only help the rich. Yet the supposed beneficiaries complain that loose money depresses returns and distorts markets. Both sides overestimate central banks’ control over the economy.